The Natuzzi Editions Daytona has the option of a clever and subtle reclining action featuring a second footrest bar appearing from under the seat and an electric rising headrest that quietly glides sequentially in one smooth movement, The engineering on the Daytona is an event to behold. With a well tailored stylish clean designer look Dayton by Natuzzi Editions is a lifestyle wuite for the modern innovator. Sled style legs finish the style to be one of the most epic models on the market today. Recommended in category 15 protected leather and featured in our gallery in grade 20 matt finish Madison natural leather. Click the PDF icon on the right to download the datasheet for the Natuzzi Editions Daytona. 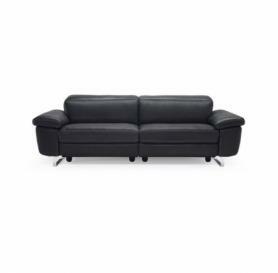 Sofas from the Daytona range can ordered and tailored to your specific requirements. Available in a range of sizes, leathers and fabrics.